This luxurious, privately owned, detached villa is situated on the sought - after Orange Tree Community on Highway 27.Within the Orange Tree Community there is a 5 acre park, tennis courts,basketball court, a soccer field and two Tot - Lots. The community is set amongst orange groves. While it is near to Orlando's world famous theme parks,15 minutes to Walt Disney World and central to all other parks,it is in a tranquil setting where guests can enjoy a relaxing retreat from a day out and about. Location. Within 5 minutes from the villa there are several supermarkets -Publix and Walmart, a bank,drug store,gas station, a post office and a walk-in clinic.There are a varied range of restaurants on H.27 and U.S.192. Lake Louisa, a State Park, which is 5 minutes north of Orange Tree offers outdoor activities - sailing,fishing,walking, boat hire,cycling, horse riding. A cinema is 10 minutes north along the H27. The many golf courses in the area include Champion's Gate, Disney Courses,Orange Gate Country Club and Legends. Our spacious 2037 sq.ft. home, has 4 bedrooms and 3 bathrooms and can sleep up to 10 people. There are 2 living areas, formal dining room, a fully - fitted kitchen with a separate breakfast nook, utility room and a games room. The Pool.The fully screened private pool is extended to 30ftx15ft, which is larger than average.The pool and patio are south - facing allowing sun worshippers to enjoy the Florida sun while the Lanai provides shade. It has a wrap around pool deck with up - graded patio loungers,chairs and table. There is a security screen around the pool. Pool toys and inflatables are stored in the Games room. The Master Bedroom has a King size bed,a walk in wardrobe with safe. The en -suite bathroom has two vanity units, bath, and a large walk -in shower. There is direct access to the pool through French windows in the bedroom. The Double Bedroom has a double bed and a fitted walk-in wardrobe. It has its own adjacent bathroom with a vanity unit and a walk in shower. The bathroom has direct access to the pool area. Twin Bedrooms each with 2 single beds.There is a bathroom between the 2 bedrooms which has a vanity unit and a bath with overhead shower. All bedrooms have cable, digital flat screen T.V.s. All bathrooms have hairdryers. The Family Room has a digital, cable, flat screen T.V, D.V.D.player, C.D.and radio. There is a selection of family board games and D.V.D.s. Direct access to the pool is through French windows. The Sitting Room has 2 armchairs and occasional tables and a Queen size sofa bed. The Kitchen has a cooker, microwave, dishwasher,waste disposal, large fridge/freezer with ice maker, coffee maker, toaster and all utensils.The breakfast nook is adjacent to the kitchen and has a table and chairs. The Utility Room has a washer,dryer, iron and ironing board. Cool boxes are provided for days out. Plastic ponchos are also available. The Games Room contains a pool table, table football and darts. There is a free-standing fan. FREE use of child's buggy with sun canopy, a travel cot and highchair. FREE local phone calls. The phone has a recorded message service. 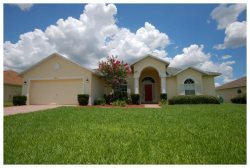 We hope that our dream home will help make all your Florida dreams come true.